London Stansted Airport, situated in the Essex county, is the gateway to the areas northwest of London. Stansted Airport schedules flights to and from over 170 destinations across Europe, North Africa, and North America. This airport offers more flights to European destinations than any other airport in the United Kingdom! London Stansted Airport (IATA code: STN) is the UK’s fourth-busiest airport and the base for several major European low-cost airlines, including Ryanair and easyJet. Flights to Stansted Airport are provided by numerous international airlines, such as Austrian Airlines, Flybe and Eurowings. STN is a 1-hour drive or a 50-minute train ride from the city centre of London. Book your cheap flights to and from London Stansted Airport online! London Stansted Airport features one main passenger terminal, designed by Foster Associates, with a “floating” roof. This large and beautiful airport began as an airfield, which opened in 1943. Shortly after its opening, Stansted Airport was used during the Second World War by the Royal Air Force and the United States Army Air Forces, operating as “RAF Stansted Mountfitchet”. Since then, London Stansted Airport has been geared towards serving commercial flights. Over the years, the airport has expanded its terminal, and plans are in place for the construction of a second terminal. 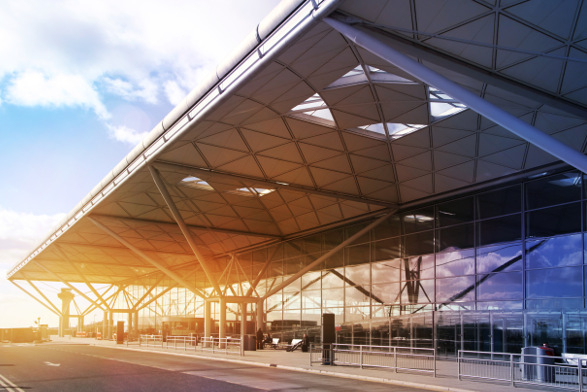 Once the new terminal has been completed, Stansted Airport will be the only airport in the United Kingdom with dedicated terminals for arrivals and departures. Stansted Airport offers you the pre-holiday experience with a variety of retail outlets, selling a range of different products from various categories, including technology, beauty, fashion, accessories, wines, sweets and toys. Make sure to follow the baggage restrictions at this airport. Two Boots branches are available in the arrivals area and at the airside area. If you have some time to spare and are feeling hungry, enjoy one of the many meal options that are available at the various eateries at London Stansted Airport. These include fast food outlets, cafés, restaurants and bars. The Escape Lounge is available for you to relax in and enjoy refreshments as you wait for your next flight. This lounge includes a great selection of food and drinks, as well as facilities such as free Wi-Fi, printing, scanning, charging points, newspapers, magazines, TVs, as well as flight information. You can reserve the Escape Lounge by booking on the airport’s website. Other services and facilities that you can make use of at Stansted Airport include free Wi-Fi (for four hours, after which you need to purchase additional time), a prayer room, baggage wrapping and weighing, ATMs, currency exchange, information desk, postal services, and business facilities. Hampton By Hilton London Stansted Airport This contemporary 3-star hotel is within walking distance of London Stansted Airport. It includes a 24-hour fitness centre, business centre, air conditioning, front desk safe, laundry service, multilingual staff and meeting rooms. A free buffet breakfast, free airport shuttles and free Wi-Fi are also available. Radisson Blu Hotel London Stansted Airport This 4-star hotel is a 5-minute drive from Stansted Airport. Amenities included are an indoor pool, breakfast, fitness centre, conference centre, 24-hour front desk, air conditioning, computer station, and 3 restaurants. Free Wi-Fi is available as well. Long Melford Swan This 5-star luxury inn is a 50-minute drive from the airport. It features a restaurant, bar/lounge, free full breakfast, free Wi-Fi and free parking. When ordering foreign exchange, make sure to do so 60 days before collecting. You can only make your collection in person. Check that you have the following documents when ordering foreign exchange. Moneycorp offices are available at the landside, airside and arrivals sections of the terminal. London Stansted Airport includes several parking options close to the terminal. Parking spaces are available for various lengths of time. Stansted Airport even offers options for travellers seeking more affordable parking options. A valet service is available as well, to ensure you can save on time when arriving at the airport. You are welcome to pre-book a parking space on the airport’s website. London Stansted Airport is situated 48 km northwest of London’s city centre. Taxis, trains, buses, coaches, Uber and car rental options are available to transport you from the airport to your destination.